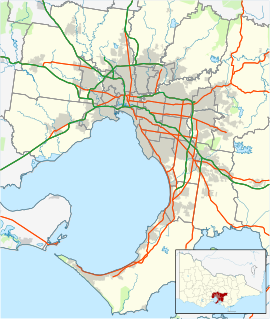 Carnegie is a suburb in Melbourne, Victoria, Australia, 12 km south-east of Melbourne's central business district. Its local government area is the City of Glen Eira. At the 2016 Census, Carnegie had a population of 17,388. Its postcode is 3163. The suburb's main shopping precinct is a well-regarded ‘eat street,’ with cafes and restaurants lining Koornang Road from Dandenong Road to Neerim Road. Koornang Park and the neighbouring Carnegie Swim Centre are located between Koornang Road, Munro Avenue and Lyons Street. Originally called Rosstown, after William Murray Ross, a prominent property developer and entrepreneur, a name change came about due to Ross' failed speculative developments. In 1909 it was renamed Carnegie. It has been suggested that this was done in an unsuccessful attempt to secure funds for a library from the philanthropist Andrew Carnegie but there is no contemporary evidence supporting this. Originally called Rosstown, after developer William Murray Ross one of the early pioneers of the area. The original name lives on in the name of the local hotel, and Rosstown Road. Leila Road is named after Mr Ross's wife, and Grange Road is named after Ross's estate, The Grange, which has since been subdivided and is now suburban housing estates. In 1909 Carnegie was chosen as a new name in an ultimately unsuccessful attempt to secure funds for a library from the philanthropist Andrew Carnegie. In 1875 Ross began circulating a broadsheet proposal which detailed the Rosstown project, a large scale sugar beet processing mill, a railway line to serve it, and a residential estate, named after him on the edge of the metropolis between Melbourne and the town of Oakleigh. Although he began building the mill, it never began production, and the Rosstown Railway he constructed was never used. However the estate sold well and gradually Rosstown had grown to a reasonable size aided by the opening of the railway to Melbourne in 1879. Carnegie Post Office opened on 1 September 1911. Carnegie was originally part of the City of Caulfield and by the 1920s it had a substantial commercial area. The Carnegie theatre was a popular cinema in the 1930s. The northern part of Carnegie and the Koornang Road shopping strip is served by Carnegie station on the Cranbourne/Pakenham line. Carnegie is served by CDC Melbourne bus routes 623, 624, 626, 900 and NightRider 980. Tram route 67 terminates just south of the shopping centre and serves the southern part of Carnegie. The Public Transport Users Association has instigated calls for its extension to the nearby Carnegie station which services the shopping centre, as a major mode interchange . There are two train services that pass through Carnegie railway station. As part of the government's level crossing removal project, Carnegie station closed in January 2017 and was demolished with a replacement opening in November 2017. Carnegie has a diverse cultural cross-section, with many permanent settlers from across the globe, and transient international students studying at the nearby Monash University (Caulfield campus). On Koornang Road alone there are restaurants and grocers offering Malaysian, Korean, Chinese, Thai, Japanese, Indian, Italian, Greek, Polish, French, Uighur and Russian foods, as well as the Rosstown Hotel. Dandenong road is increasingly becoming a focus of Carnegie's development. Originally the Rosstown Hotel was the focus of this part of the commercial strip, however today there are numerous showrooms and homemaker stores including Officeworks. The main primary school is Carnegie Primary School (No. 2897) (established in 1888 as Rosstown State School). ^ Australian Bureau of Statistics (31 October 2012). "Carnegie (State Suburb)". 2011 Census QuickStats. Retrieved 11 February 2013.